Is Early Surrender Alive & Well? I recently played blackjack in one of the best games in the country. Imagine a shoe game that gave basic strategy players an edge off the top! Imagine a game with excellent rules – double on any two cards, dealer stands on soft 17, double after splits allowed, re-splits allowed up to 3 hands and the ability to “early surrender”! I drove over 200 miles to play in this game and to confirm that it existed. Although it was a long trip, it was the most fun I have had playing blackjack in a long time. Before I went I had to brush up on early surrender basic strategy and the corresponding play variation numbers. It is not every day you find a game with early surrender! Early surrender is a very advantageous rule for the player who knows the correct basic strategy. This strategy adds about 0.7% to the player’s overall expectation. In the game described above players have about a 0.2% advantage off the top of the shoe. Don’t confuse this rule with “late” surrender where you are allowed to surrender “only” if the dealer does not have blackjack. Although late surrender is a good rule for the players it doesn’t compare at all with early surrender. I know what you are asking. Where is this great game? Well, as I write this article the game was still being dealt — which is very unusual! Actually, when I played the game for the first time I learned that early surrender had been offered for almost a month here. The game was found in New Port Richey, on the West coast of Florida just North of Tampa. The day cruise ship casino is called the SunKruz. Actually, there are two ships, which sail 4 times a day for about 3-4 hours of gambling in International waters. The SunKruz casinos offer some of the best rules available anywhere which is great for players of all kinds. I doubt if the early surrender rule will last another month, especially now that every card counter in the world knows about it. But you never know! Although the game above has great rules the casino was smart enough to limit the penetration severely. The 6 deck games had about 2 decks cut off and the 8-deck shoes had almost 3 decks cut out of play. Still, with the great rules you could bet big in any positive count and have a nice edge. If the count drops significantly below zero a good strategy would be to take a break from the table until the shuffle, although playing through slightly negative counts with minimum bets is not that bad. This casino wants your action! You will also find craps tables with 100 times odds and double deck with the same good rules except surrender. They even offer a hand shuffled (6 deck) double exposure game with double on any first two cards, DAS, S17 and 3 hand re-splits. Of course, the dealer takes ties in this game (including blackjacks) and blackjacks pay even money. Still, perfect basic strategy play will net you a positive advantage of about 0.14%. Maybe I should forget about early surrender and brush up on my double exposure game. FOOTNOTE: For those unfamiliar with the rule — surrender is an option that allows the player to give up half of his bet if he doesn’t like his cards. “Early” surrender allows the player to give up half of his bet “before” the dealer checks to determine whether or not he has a blackjack. The complete basic strategy for this rule can be found in Dalton’s Blackjack: A Professional Reference. In the early years of Atlantic City blackjack (1979 – 1981) early surrender was regularly offered. 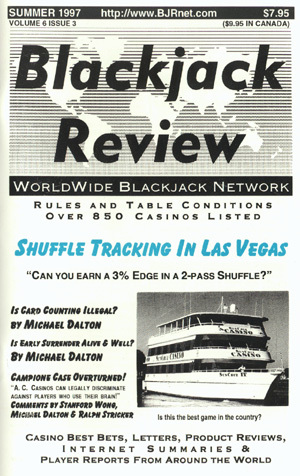 POSTNOTE: Just as the Summer 1997 issue of Blackjack Review was going to press I was informed that this game was no longer available with early surrender. I believe they still offer the other good rules, however.